This article introduces basic Book of Mormon geography based on the February, 2019 version of the Magleby-Tovar Book of Mormon Map. Kirk Magleby lives in Utah. Javier Tovar lives in Hidalgo. This map successfully passed 11 stringent tests designed to evaluate degree of fit to the text. See the articles in this blog entitled "Test #1 Ups and Downs" through "Test #11 The Big Picture." 1. Authority. The primary source for evidence about the real-world location of Book of Mormon events is the text itself. Written by eye-witnesses and translated by the gift and power of God, the Book of Mormon is the most divine object most of us will ever hold in our mortal hands. The Lord could have revealed the location to Joseph Smith, but He did not just as He has not to any Prophet since. See the Church's January, 2019 Gospel Topics Essay on Book of Mormon Geography. I know people who personally guided modern-day Apostles and Prophets on visits to ancient American archaeological sites such as Izapa, Tikal and Teotihuacan. I have read modern-day Apostles and Prophets' marginalia in books they once owned such as Popol Vuh. The brethren who have dealt with it have not considered the matter settled, but have wrestled with the geography issue just like the rest of us. 2. Setting. Based on close reading, most modern Book of Mormon scholars (Sperry [1895 - 1977], Nibley [1910 - 2005], Ludlow [1924 - 2009], Sorenson, Welch, Skousen, Givens, Hardy) are persuaded Mesoamerica best fits the text. As with all images on this blog, click to enlarge. 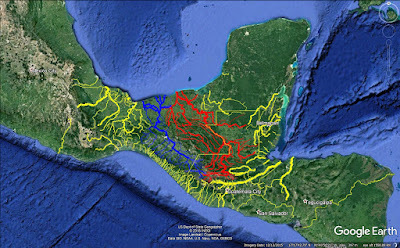 Why Mesoamerica? See the article "The Case for Mesoamerica." 3. Voyages. Jaredites ca. 2,300 BC, Mulekites ca. 595 BC., Lehites ca. 590 BC. 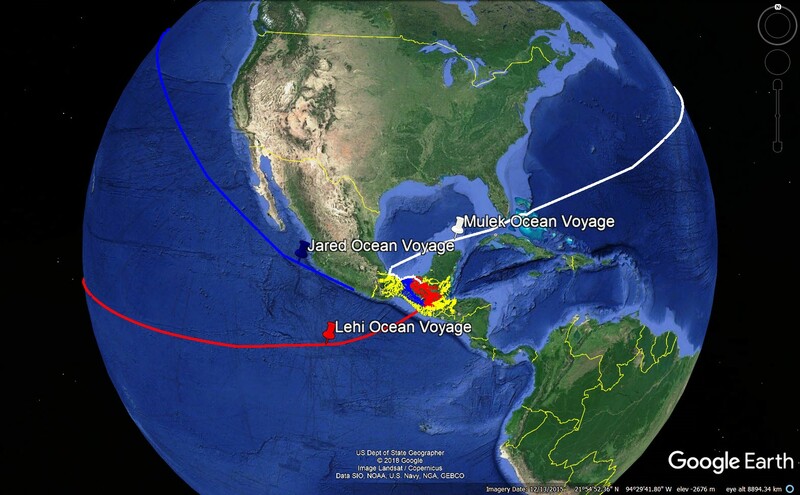 Most students of the text accept a Lehite landfall on the Pacific coast based on Alma 22:28 and a Mulekite landfall on the Atlantic coast based on Alma 22:30 and Omni 1:16. Whether the Jaredites crossed the Atlantic or Pacific is ambiguous in the text. A Pacific crossing correlates well with the length of time it takes for Asian debris to wash up on North American shores. See the articles "Test #6 Relative Distances" and "Tracking the Jaredites." An Atlantic crossing is too short for the 344 days at sea reported in Ether 6:11. Columbus in 1492 crossed from Spain to the Canary Islands in 6 days, and from the Canaries to the Bahamas in 42 days. In 2018, Bryce Carlson from Cincinnati set a new world's record for a solo row across the Atlantic. He did it in 38 days, shattering the previous record of 53 days set in 2016. The Ocean Rowing Society is the official adjudicating body of solo rows across the Atlantic. My friend, Richard Jones of Midvale, Utah, rowed across the Atlantic in 2000-2001 in a homemade 27-foot boat he named "The Brother of Jared." 4. Marine environment. The Nephites were conscious of their proximity to salt water. The article "Smoking Gun" shows how frequently aquatic terms occur in the text. According to 2 Nephi 10:20-21 they believed their promised land was an isle of the sea. 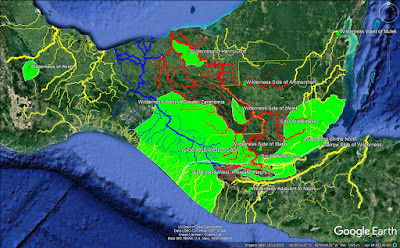 Alma 22:32 says the greater lands of Zarahemla and Nephi (most of what the Jaredites and Nephites called the "land southward") was nearly surrounded by water. 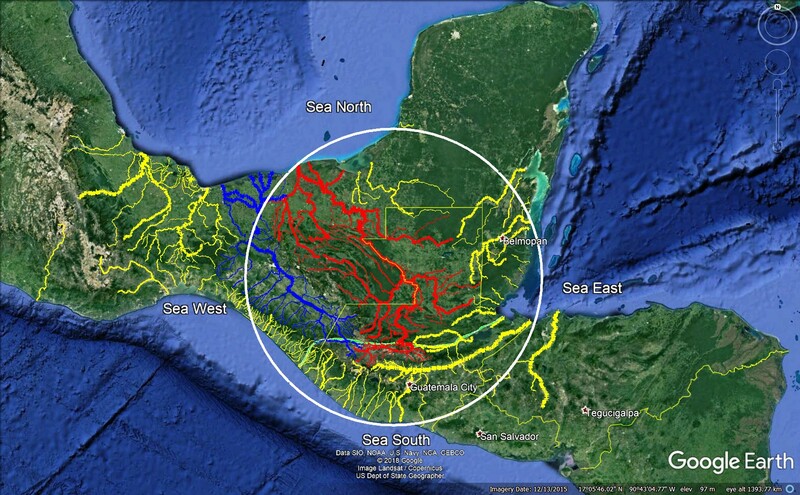 Mesoamerican cultures often perceived themselves surrounded by bodies of water in the four cardinal directions. See the article "Quichean Directionality" for examples. The Nephites perceived themselves surrounded by oceans in the four cardinal directions Helaman 3:8. The map circle above roughly corresponds to our correlation of the Jaredite and Nephite "land southward." 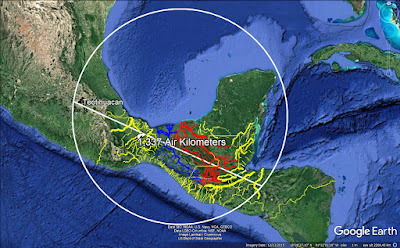 No point in this circle is more than 250 air kilometers (155 air miles) from salt water. 5. Orientation. The Book of Mormon uses the term "land southward" 14 times and "land northward" 30 times. We assume a "northward" heading is not as close to true north as a "north" azimuth would be. So, we expect the major Book of Mormon lands to be oriented either northwesterly or northeasterly. The straight line on the map above runs due NW to SE. 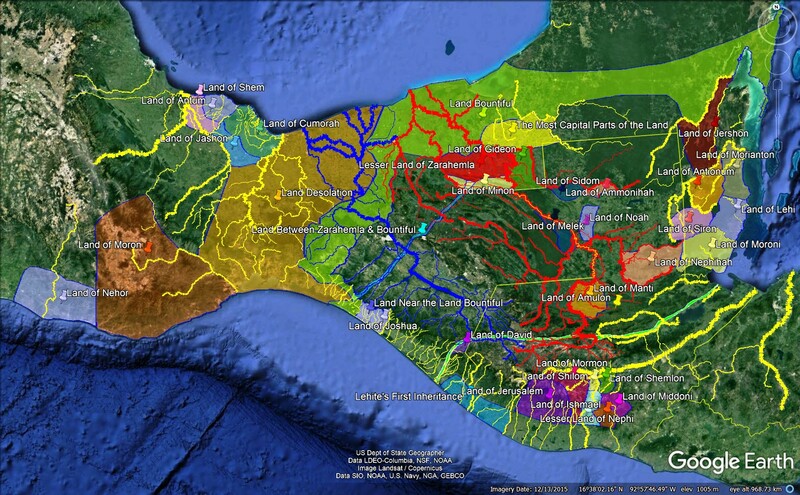 It precisely follows the Pacific coastline of Chiapas. 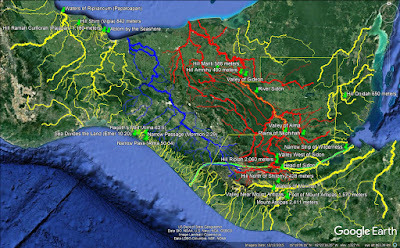 The Chiapas coastal plain was a major travel corridor anciently as it is today. 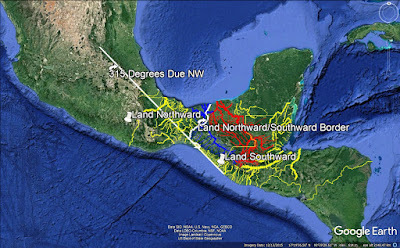 The NW SE orientation of the Chiapas coast is probably the origin of the Book of Mormon terms land "northward" and "southward." 6. Size. The Book of Mormon term "day's journey" is most likely a Nephite standard unit of distance measure. See the articles "Textual Progress" and "Land Southward Travel Times" for context. Plotting all instances of a "day's journey" (Test #6 Relative Distances), the terms "near" and "far" (Things Near and Far), the term "by" (By and By), the terms "narrow" and "small" (Narrow and Small Things), and the terms "many" and "few" (How Many were Many and Few?) we can deduce plausible minimum and maximum values for the the size of the Nephite known world. It turns out to be 750 to 1,500 air kilometers or 500 to 1,000 air miles. Other careful students of Book of Mormon geography such as Jesse Alvin Washburn (1873-1951), his son, Jesse Nile Washburn (1901 - 1986), and John L. Sorenson have arrived at similar numbers. Beyond the Mexico City area on the northward or the Ulua River in Honduras on the southward was probably terra incognita in the Nephite worldview. 7. Polity sizes. The Book of Mormon uses almost 20 different terms to describe settlements or occupied areas - what contemporary archaeologists call the "built environment." 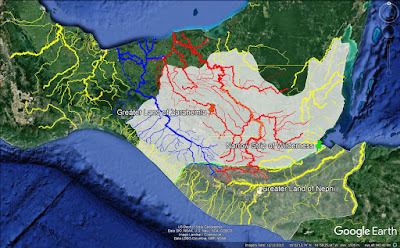 See the article "Nephite Political Geography." The most important political units by far were cities and lands. 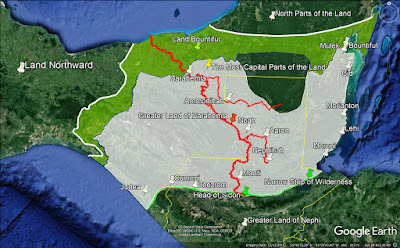 Many Nephite lands are described as a capital city with surrounding agricultural or wilderness territory Mosiah 7:21, Mosiah 23:25, Alma 43:25, Alma 58:13. In other words, the Nephites often organized themselves in an alliance of defensible city states like the Sumerians, Egyptians, Greeks, Romans, Britons, Maya, etc. Ancient city states were not randomly spread across landscapes. Most averaged 2,000 to 3,000 square kilometers in surface area for good reason. See the article "Test #7 Land Areas." A polity smaller than 2,000 square kilometers may struggle to maintain a military force strong enough to defend itself against larger neighbors. A city state much larger than 3,000 square kilometers may be vulnerable to attack on the periphery because its militia would have difficulty mustering and marching to remote hot spots quickly enough to respond to threats. See Alma 16:3 for an example of an army unable to deploy in time to prevent devastation. Exceptions existed, of course, but in general the surface areas of ancient city states tended to average about 2,500 square kilometers because of immutable factors such as the distance an army could march in one day. The map above shows possibilities for 3 exceptional lands (Moron, Desolation, Bountiful) that are near-continental in scope and clearly not city states. Greater Zarahemla and Greater Nephi, omitted to avoid clutter, were also much larger than mere city states. The other 33 proposed lands could have been city states. They average 2,362 square kilometers in land area - right in the sweet spot of city states known from antiquity. Viable Book of Mormon maps will have reasonable land sizes. 8. Wilderness. Jaredite, Nephite, and Lamanite territories were not contiguously settled. Embedded wilderness was everywhere present. The term "wilderness" occurs over 200 times in the text. Its does not mean absence of humans. The Lamanites built strongholds in the wilderness Alma 50:11. It may be associated with mountains as in Helaman 11:31, but wilderness in Nephite parlance could also refer to a coastal plain as in 1 Nephi 16:14. Wild beasts lived in the wilderness 1 Nephi 7:16, Alma 2:37, Ether 10:21. Wilderness was an untamed place outside of political control. See the article "A Note about Wilderness." For a discussion of the very interesting wilderness of Hermounts, see the article "Hermounts." 9. Narrow strip of wilderness. The land southward contained land Bountiful and the greater lands of Zarahemla and Nephi. 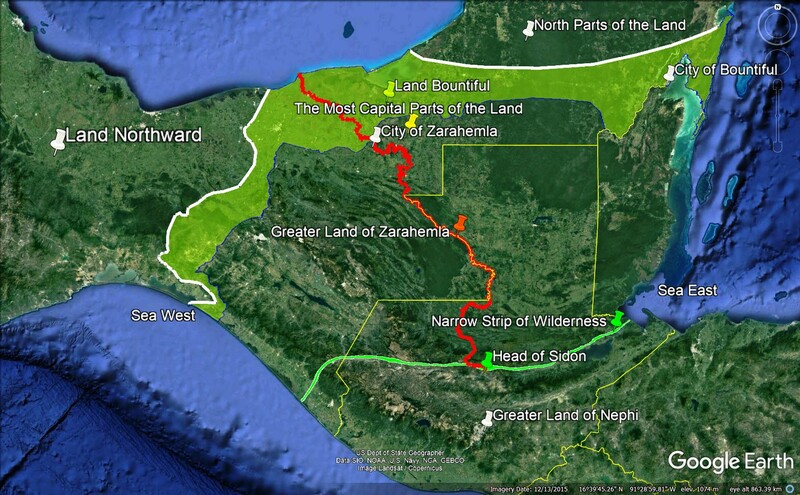 A narrow strip of wilderness separated greater Nephi on the south from greater Zarahemla on the north Alma 22:27. We (along with many others) correlate the narrow strip of wilderness with the Polochic Fault, the interaction zone between the North American Tectonic Plate to the north and the Caribbean Tectonic Plate to the south. 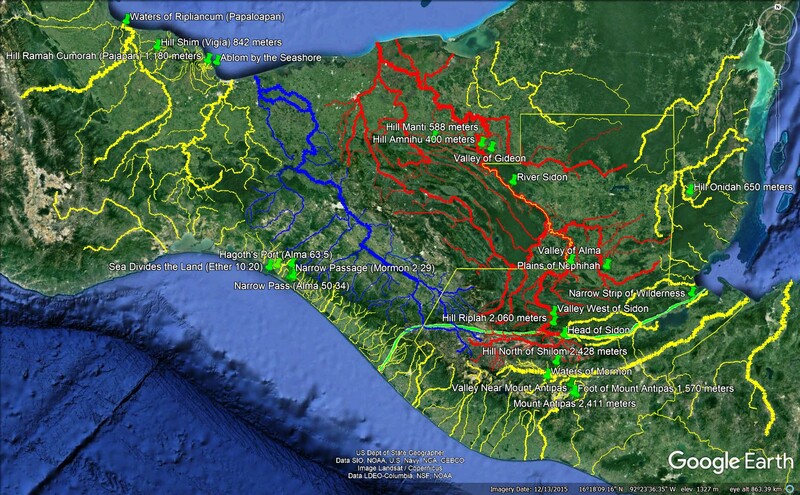 See the articles "The Narrow Strip of Wilderness" and "Ubiquitous Narrow Strip." 10. Natural features. Besides polities and wilderness, the text describes geo-physical features of the landscape such as hills, mountains, waters, valleys, a river, a harbor, etc. 11. The big picture. The text explicitly names four continental-scale entities that ran from sea east to sea west: land Bountiful, greater Zarahemla, narrow strip of wilderness, and greater Nephi. See the article "Test #11 The Big Picture." The Sidon corridor where Zarahemla was located was in the center Helaman 1:24-27 or heart Helaman 1:18 of Nephite lands. River Sidon ran generally from south to north. 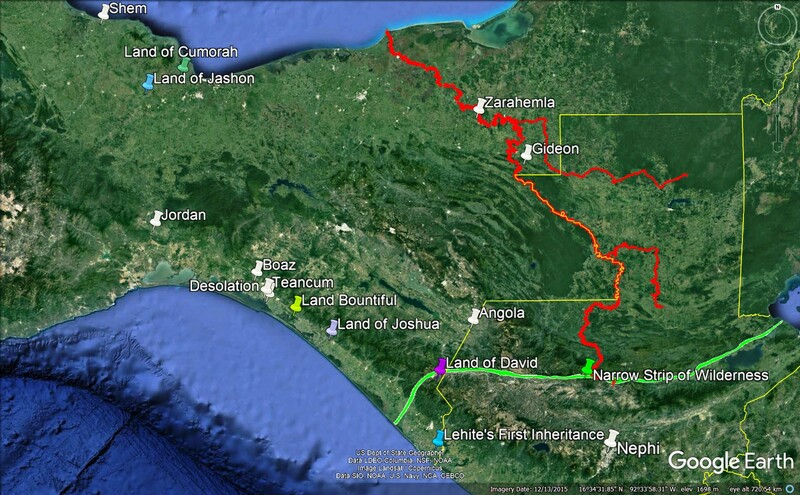 See the article "River Sidon South to North." North of greater Zarahemla was land Bountiful Alma 22:29 and north of land Bountiful was the north parts of the land Helaman 1:23. Coriantumr in Helaman 1 was trying to surround the Nephites who vigorously protected land Bountiful so they always had an escape route Alma 22:34. Amalickiah had invaded the east coast Alma 51:26 and ultimately failed. His brother, Ammoron, had invaded the west coast Alma 52:12 and ultimately failed. Now in Helaman 1, the Lamanites were invading via the central Sidon corridor. They ultimately failed, but their next invasion in Helaman 4 drove the Nephites completely out of greater Zarahemla into land Bountiful. 12. Strings of settlements. Before Utah achieved statehood in 1896, the Latter-day Saints settled colonies from Alberta, Canada to Chihuahua, Mexico and from California to Colorado. This was a vast area over 2 million square kilometers in extent. But, the entire membership of the Church in 1896 was only 241,000 and some of them were overseas. Latter-day Saints were spread very thinly over a large territory in strings of settlements set among large numbers of other people. Ultimately, the Latter-day Saints effectively controlled only the state of Utah (219,890 square kilometers) and over time even that society became increasingly pluralistic. The Nephites under Captain Moroni founded settlements from Judea on the west coast to Moroni on the east coast with Manti in the middle. On our map, greater Zarahemla ca. 60 BC had a surface area of 138,000 square kilometers, about the size of the state of Arkansas. Some idea of Nephite populations can be deduced from data in the article "Population Sizes & Casualty Counts." Ancient populations are notoriously difficult to estimate. See the article "Prophecy Fulfilled 010" for insights. Applying pessimistic demographic assumptions, the Nephites ca. 60 BC numbered at least 750,000. More optimistic assumptions could push that number to 1 - 2 million. The Nephites were spread very thinly Alma 58:32 across this large territory in strings of allied settlements set among large numbers of other people. Ultimately, they lacked the manpower to defend such a huge area and by ca. 34 BC the Nephites lost control of greater Zarahemla Helaman 4:5. 13. Sovereignty. The Nephites did not exercise exclusive sovereignty over their territory the way a modern state does. Nephites co-existed in their promised land with king-men Alma 62:6 and other dissenters Alma 8:17, Lamanites Helaman 5:16, Gadianton robbers Helaman 7:4, etc. 14. Nephite capitals. The Nephites helped settle the land of first inheritance 1 Nephi 18:23 and lived there until Lehi I died. They then founded their highland capital, Nephi, 2 Nephi 5:8 which they occupied from ca. 588 BC until ca. 200 BC. Mosiah I led the Nephites into lowland Zarahemla Omni 1:13 where they joined with the numerically superior Mulekites. Zarahemla remained the Nephite capital until ca. 62 BC when an insurrection of king-men forced chief judge Parhoron (critical text orthography) to set up a government in exile across the Sidon in the land of Gideon Alma 61:5. The following year, with the help of Captain Moroni, the Nephite government was restored to the city of Zarahemla Alma 62:8. A Lamanite invasion ca. 34 BC forced the Nephites out of greater Zarahemla into land Bountiful Helaman 4:6. The Nephites regained Zarahemla via military action by ca. 31 BC Helaman 4:10. Zarahemla was burned ca. AD 33 3 Nephi 8:8 and rebuilt within two decades 4 Nephi 1:8. The final war of Nephite extermination began ca. AD 322 in the lesser land of Zarahemla Mormon 1:10. From there the Nephites followed Mormon in a gradual retreat to Angola Mormon 2:4 followed by David Mormon 2:5 and then Joshua by the west sea Mormon 2:6. From there they went into the land northward to the land of Jashon Mormon 2:16 and finally to Shem Mormon 2:20. Shem was the northernmost Nephite capital, a fortified gathering place. From Shem the Nephites mounted a counter offensive resulting in a treaty Mormon 2:28 giving them temporary respite in the land northward. Mormon then focused Nephite effort on extraordinary fortifications in the city of Desolation Mormon 3:5. The Nephites were driven to the nearby city Teancum Mormon 4:3. They retook the city of Desolation briefly Mormon 4:8 only to lose Mormon 4:13, 14 and then regain Mormon 4:15 both Teancum and Desolation. The Lamanites with massive manpower drove the Nephites to Boaz Mormon 4:20 and then to Jordan Mormon 5:3. The Nephites made their last stand at hill Cumorah Mormon 6:2. The Nephites changed their capital 20 times in the 975 years from ca. 590 BC to AD 385. This is the story of a beleaguered minority forced from their homes frequently at sword-point. What is the Great and Abominable Church?